A day at Disneyland is usually fun in the sun thanks to Southern California's reputation for year-round sunshine - unless you happen to show up at the theme park on one of the 23 days when it rains each year on average in Anaheim. This will go down as one of the rainiest weeks of the year in Anaheim, with the forecast calling for showers stretching into the weekend. While Disneyland remains open during the rain, some parks such as Knott's Berry Farm and Six Flags Magic Mountain have closed for the day because of the inclement weather this week. The most obvious option on a rainy day is one of Disneyland's many indoor shows. 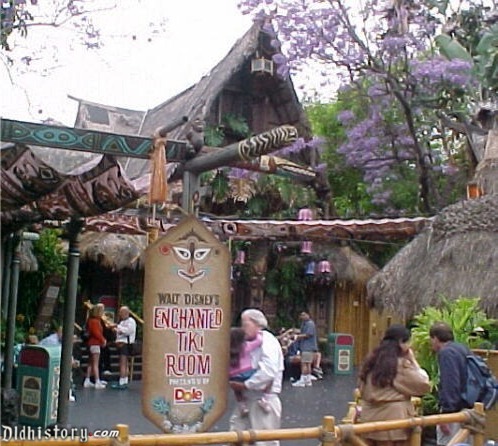 The Enchanted Tiki Room, Fantasy Faire Royal Theatre and Mickey and the Magical Map are always good rainy-day bets. It's been awhile since you've seen Great Moments with Mr. Lincoln. The classic Disneyland attraction is the perfect place to dodge raindrops and catch up on your history. Or check out the Golden Horseshoe revue that you've always been meaning to see. Fortunately, many of Disneyland's most popular attractions are indoors, including most of classic dark rides in Fantasyland. Hitting attractions with longer ride times will mean more time indoors and less time out in the rain. Pirates of the Caribbean, Haunted Mansion, It's a Small World, Star Tours and Finding Nemo Submarine Voyage are all good bets on a rainy day. Some Disneyland attractions temporarily close during rain or lightning, including Mad Tea Party, Alice in Wonderland, Storybook Land Canal Boats, Gadget's Go Coaster and Tom Sawyer Island. Try to hit outdoor attractions before it starts raining or during breaks in the weather. Nobody wants to ride Dumbo the Flying Elephant in the rain. A rainy day is not a good time to check out the new Tropical Hideaway eatery in Adventureland, which features outdoor seating on the banks of the Jungle Cruise. Skip the food cart lines for churros and popcorn, too. You'll want to hop into Blue Bayou in New Orleans Square or Carnation Cafe on Main Street USA for a nice meal out of the elements. If you've got the time, head over to the Napa Rose in Disney's Grand Californian Hotel for California cuisine and wine. Or grab a bite at Ralph Brennan's Jazz Kitchen or have a beer at the new Ballast Point brewpub in Downtown Disney. One of the few things Disneyland likes about rainy days is that visitors spend more time in the shops spending money on souvenirs. The storefronts on Main Street USA are all connected so you can stroll from one shop to another with having to step outside into the elements. Disney doesn't want you to slip and fall, but they don't mind if you put a dent in your credit card on a rainy day. The newly remodeled World of Disney will happy to separate you from your hard-earned cash when it's wet and blustery outside. It goes without saying you'll want to wear water-resistant shoes and a hooded rain coat to Disneyland under threatening skies. But you'd be surprised how many people forget to bring an umbrella to the park on rainy days. Disneyland will gladly sell you a plastic poncho and a mini-umbrella for a premium price. Ask a shop attendant for assistance if you don't see rain gear on display. Dollar stores sell cheap umbrellas and ponchos that will save you money if you remember to plan ahead. And maybe the most important rainy day tip of all: Pack an extra pair of socks. Bring a small hand towel from your hotel or a chamois swimming pool towel that can be wrung out. You'll be surprised how often you might need a towel to dry off throughout the day. You'll want to make a beeline to the rental lockers in Disneyland if the skies are threatening rain. They'l sell out fast once the first raindrops start falling. Lockers with in-and-out privileges are the perfect spot to stash dry clothes that can be swapped out for wet clothes later in the day. They're also a great place to stow ponchos, umbrellas and jackets if your luck changes and the rain stops. Full body dryers are one of the greatest inventions in theme park history. Normally designed for drying off after a water ride, the giant dryers can fit up to five wet people for $5. You'll have to have a park hopper ticket to use the Wilderness Warming Huts next to Grizzly River Run at Disney California Adventure. If you get soaked and insist on staying in the park, then you might as well embrace it. Get in line for Splash Mountain or hop on the Jungle Cruise. Sit in the front seat on Matterhorn Bobsleds or Pirates of the Caribbean. Go play in the puddles and splash in the rain. You can always get a dry new wardrobe in the Disneyland shops for a price.